Marlene Malahoo Forte (centre), MP, West Central St. James, authorizes the documents at the official signing of partnership agreement between the Phillip and Christine Gore Family Foundation and HEART Trust/NTA. Phillip Gore, founder and Executive Chairman of Gore Developments Limited (GDL) and Janet Dyer, Managing Director at Heart Trust/NTA, smile as the partnership becomes official. 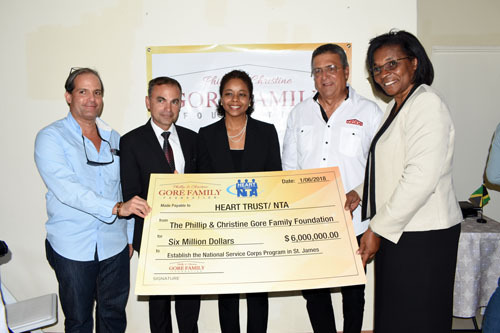 The Phillip and Christine Gore Family Foundation presented HEART Trust/NTA with $6 million last Friday at the signing of their partnership agreement. Through the Government of Jamaica’s Housing Opportunity Production and Employment (HOPE) Initiative, youths from 18-24 years are engaged in the National Service Corps Programme (NSCP). NSCP is implemented through the HEART Trust/NTA and targets unattached youths who will be given technical skills training which will be honed over a period of up to one year. The foundation has agreed to partner with HOPE and will sponsor 25 interns from St. James (Granville especially) for training (HEART and JFLL) and job placement will be provided on completion of that training. “And the truth is, and certainly in my interactions with unattached youths in various communities across Jamaica, the vast majority always wants to do well. The reason they get involved with things is because they end up with no choice,” he continued. In that regard, he is calling upon other organizations, industries, employers and government entities to come onboard with the HOPE and HEART Trust Programme to create more meaningful opportunities. With over 200,000 at-risk youths in Jamaica, the programme currently has 3,000 individuals due to issues regarding limited space, while another 5,000 have recently been trained and are awaiting placement. Colonel Rickman went on to mention that unlike other programmes, the drop-out rate is at 1 percent, however, in all cases, this is due to employment opportunities as a result of good values and sufficient skills learnt. Held on the grounds of the Gore Homes Montego West Village, it was announced that statistically, as little as 40 percent of funds donated reaches the beneficiaries but in this specific case, 100 percent of the funds will go directly towards the individuals to be benefitted. Particularly grateful for the partnership is Attorney-at-Law and Member of Parliament for West Central St. James, Marlene Malahoo Forte, who shared that the amendment to the National Development Act establishing the National Service Corps (NCSP) was one of the three bills Prime Minister Andrew Holness held near and dear to his heart during the 2017/2018 budget debate. However, after facing many obstacles and the possibility that it would not have been completed in time for the Prime Minister to make his presentation, through arduous work, the bill was completed. “This was the first programme worthy of partnership and it pleases me greatly because a lot of thought and a lot of love went into this programme. Already we are seeing how it is changing lives positively,” said MP Forte. In addition to the $6 million in financial support, HOPE has also committed to assisting with placing/mentoring interns in key skill training areas such as Plumbing, Landscaping, Construction, among others. Some core skills include Personal Development, Work Ethics, Personal Financial Management, Citizenship, Teambuilding and Conflict Resolution. The specific skills training is in line with jobs that are marketable such as Construction, IT, Office Administration, Digitizing, Hospitality and Customer Service. The NSCP targets youths 18-24 years, not enrolled or employed in an approved educational institution. CXC passes are an asset but not a requirement. Requirements for enrollment into the NSCP include completed application form with photograph attached, copy of birth certificate and copy of a government-issued ID. Can Rastafarians Secure Economic Enablement through the Ganja Industry?